In the first of this easy reader series, pilot Captain Fred Stone finds an adventurous feline he names Flyball. Stone is a bit of a rogue – doing things the way he wants to do them, which is not always in keeping with his superior officers’ methods. But as Stone is the best pilot the military has, he’s given a lot of leeway. And so when Stone, who is about to fly a rocket to the moon asks that a spacesuit be fitted out for Flyball, his request is grudgingly granted and he and the Space Cat fly to the moon. Learning to maneuver in zero gravity gives Flyball a few challenges but he works it out. On the moon, Flyball (and Stone) discover an unusual life-form that appears to be a plant-like bubble. But then Stone falls and cracks his helmet against some rock and knocks himself out. Flyball comes to the rescue, covering up the crack with his suited paws, but he knows that he can’t stay that way forever. The bubble-life-form manages to get Flyball’s attention and the cat understands its intention. The bubbles are sticky – so sticky that he has trouble getting his paws out of the mess – and Flyball manages to secure a bubble over the crack in Stone’s helmet. Stone wakes up, recognizes Flyball as a hero and the bubbles as an intelligent life form. 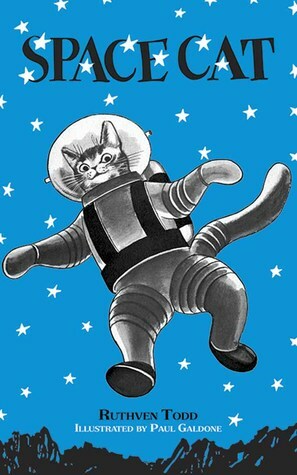 Hooray for Space Cat! The story is simple, a little bit goofy, and totally charming. It’s classic 1950’s sci-fi children and it’s just adventurous enough that today’s early readers can get interested in it. Is the science plausible? No. In 1952 it was questionable. But look at today’s fantasy and science fiction for kids. Is that any more plausible? Not really. The book is simple fantasy fun with a charming cat at the center of it. What more can you want? The artwork by Paul Galdone is also classically 1950’s. It’s a ‘styled realism’ that was rather unique to the period. It works well with the story. I’d be thrilled to keep this book on my shelf (you might find some used copies around still, but fortunately Dover is re-publishing it just as it was, but a bit cleaner and sharper) for visits from nephews, nieces, and someday grandchildren. Looking for a good book? Space Cat by Ruthven Todd is a simple but delightful very short chapter book for early readers. The cat in space and his adventure there will capture the young readers interest. Flyball, the Space Cat is no longer a stranger to space as he now lives in Luna Port on the moon in this second book in Ruthven Todd’s easy reader series. Now Flyball and his human, Fred Stone, are on a mission to investigate Venus – the most earth-like planet (other than Earth) in the solar system. Flyball is much more accustomed to weightlessness now, so the trip to Venus is a piece of cake. But the gravity of Venus becomes a challenge. Even though it’s much like Earth’s gravity, Flyball had gotten to like the weightlessness of the moon. Even Fred Stone didn’t really know what to expect when landing on Venus and the ammonia rain that greets them gets their adventure off to a rough start! But soon they meet some interesting plants that can speak to them through telekinesis. Not only can the plants talk to both Fred and Flyball, but they are able to connect the two, so now Fred knows precisely what Flyball is thinking. Like the first book, this is just goofy fun. The science is even more ‘off’ here than it was in the first book, but when you’re talking about a cat that is travelling in space, I think science has gone out the window all together. We must remember that these books were written even before the Russians sent a dog into space. Paul Galdone’s artwork, as with the first book, is appropriate and very period. Early readers will enjoy the chance to look at the pictures while reading. I will say that I laughed heartily at one picture in which Fred Stone, at the controls on his space ship, sat relaxing in a chair and smoking a pipe. Very 1950’s indeed! Looking for a good book? 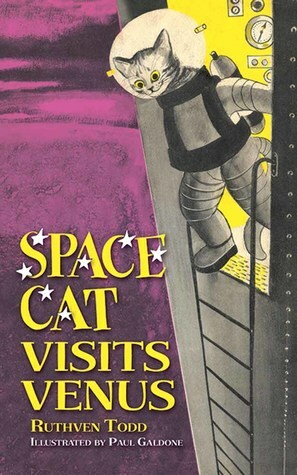 Ruthven Todd’s second book in the Space Cat series, Space Cat Visits Venus is as delightful and innocent as the first and beginning readers will enjoy the exploits of this cat in space.